I’m not going to take your job Rembrandt. Well not until my painting improves! The port side gunwale below the cratch was lightly sanded this morning and I then gave it a second coat of paint. The previous layer had ‘bloomed’ which meant I needed to apply another coat. This time the brush marks are very visible. I actually anticipated this was going to happen because the paint appeared to ‘drag’ as it was being applied. My fault, I should have put more Owatrol into the mix. Oh well, the weather forecast is for another fine day tomorrow allowing me to make a third attempt at getting it right. Practice makes perfect…. as they say! Jan and I went for a wander down the towpath in the afternoon and then walked across to the local ‘common’. On the way I noticed Steamboat Swallow is moored at Clifton Cruisers. Her exterior looks somewhat ‘tired’. 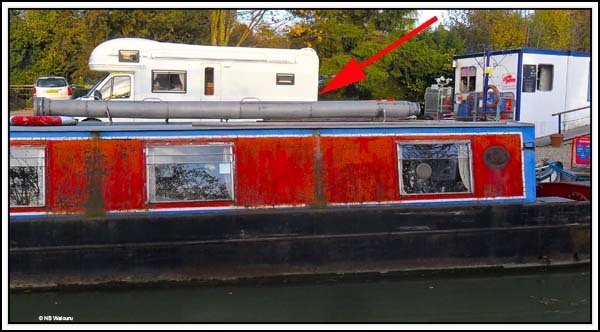 There appears to be a very long flue extension on the cabin roof which must make things interesting approaching a bridge hole. A quick search on Google doesn’t reveal much about Swallow and I wonder if any readers have more information? The common is obviously popular with the local dog walkers which enabled Jan to get her dog patting “fix”. She also pointed out a squirrel in a distant tree. I couldn’t see it in the distance and wasn’t all that interested as they don’t have much meat on them! 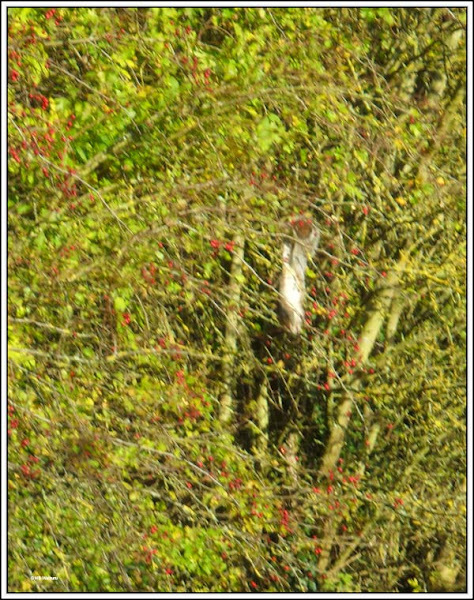 The little Samsung camera could only take a blurred distant photo of the squirrel hanging upside down by one hind leg eating the berries. Actually we were also out foraging. 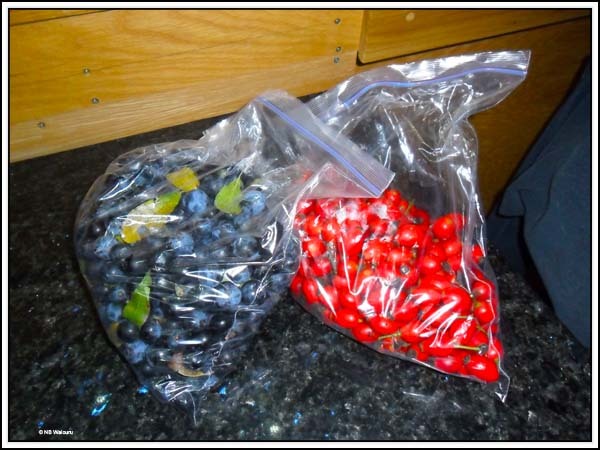 The plan is to make our first attempt at sloe gin and rosehip syrup. Jan also spied an apple tree overhanging the path and intends to go back to strip it bare when the coast is clear! I found this website which is dedicated to Steamboats of all types. 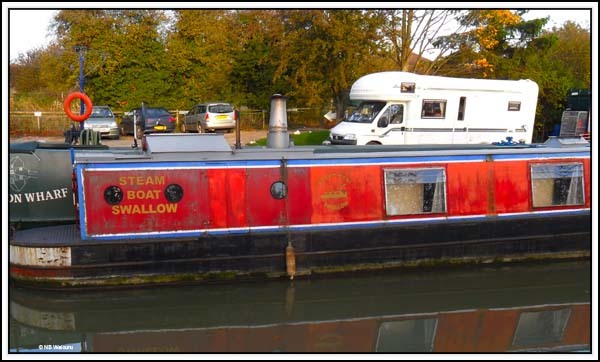 If you scroll down the entries of this forum there is a list of registered Narrowboats that are steam powered. When I opened your link it only took me to queries on one steam boat. We've actually seen a number of small replica steam powered small timber boats. I'll have another look at the boat for a Boat Index Number. Yes but further down 3 posts there was a list of steam narrowboats here is a video of swallow in a tug of war. Built in 1974. by Stowell Bros of Chesterﬁeld she is 61‘ long trad canal boat all steel and weighs 22 tons. Boiler is a 1960 Clarksons vertical thimble boiler holds 80 galls and is a 600 lbs/hr with full boilercert and is oil ﬁred with 12v Beckman - oil burner system which is fully automatic. Engine is a 1953 Robey single cyl 6” x 6" complete with water pump and lubricator and is direct drive via 3/4ton ﬂywheel to a 28x32 prop. Working pressure is 120 psi and runs the engine at up to 175 rpm. The water is taken from the canal ﬁltered and pre heated before pumped into the boiler, there is also a Pembethy injector. Diesel is fed from a 1250 ltr tank and ﬁltered and pumped to the Beekman burner which has fail safe cutout devices and there is also a low water monitor unit. The boat comes complete with a BSC till May 2016 and a full steam plant history and boiler plans it has 4 berths. toilet shower. living room and galley. she has a 1000 ltr water tank with a fully pumped cold water system which can even be fed to the boiler water feed system in case of emergencies.